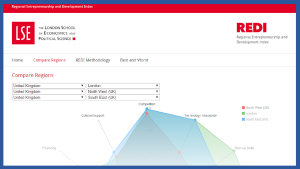 GEDI’s regional entrepreneurship index, the REDI, is now available in an interactive online tool hosted by the London School of Economics. Visit http://blogs.lse.ac.uk/redi/compare-regions/ to compare the entrepreneurship ecosystems in sub-national regions within the EU and understand the strengths and weaknesses of one region as compared to others. How might policymakers use this tool? A policymaker can compare UK regions to understand whether policies focused on improving start-up skills among entrepreneurs are most needed in London or Manchester, and whether financing or tech transfer is a more important policy focus in West Midlands. a focus on high-growth SMEs. These co-existing foci reflect evolution in the understanding of the varied roles that entrepreneurship can play in economic development. However, although each of these focus areas adds important elements to the European economic policy toolbox, none of them alone provides a definitive answers to the diverse and varied challenges that different European regions face, as they seek to implement policies to enhance regional dynamism and competitiveness. The most recent evolution in entrepreneurship policy – an increasing emphasis on taking a more holistic and multi-pronged view of entrepreneurship, as advocated by the ‘entrepreneurship support ecosystem’ thinking – represents yet another evolution in European policy thinking. The focus on ‘entrepreneurship ecosystems’ calls attention to entrepreneurship support policies and initiatives over the entire lifecycle of the new venture, the key insight being that entrepreneurship support should be considered in a wider regional context. Thus, this emphasis naturally shifts focus towards a regional level of analysis, consistent with the focus of this current report and its ‘Systems of Entrepreneurship’ approach. Yet, although similar on the surface, the two concepts are fundamentally different. Whereas the notion of ‘Entrepreneurship Ecosystems’ focuses on entrepreneurship support policies and initiatives from a policy perspective, the notion of ‘Systems of Entrepreneurship’ draws attention to the entrepreneurial dynamic that ultimately drives productivity growth in regions. The two approaches therefore complement one another, and the REDI index should provide important guidance for the design of entrepreneurship support ecosystems.